The 2016 General Election is growing near and candidates are in the home stretch of the campaign season. The political climate has been tense, to say the least, and although the electorate may seem highly polarized, there are plenty of citizens who feel entirely left out of the political process. Polling data indicate that educational attainment may play a role for voters, possibly influencing whether or not they will vote. According to the U.S. Census Bureau, common reasons given for registered voters declining to vote in 2012 included “Not interested” (15.7%), “Didn’t like candidates or issues” (12.7%), and “Other reasons/don’t know” (14.1%). What if the survey options included, “I don’t understand politics,” “I don’t know how or where to vote,” or “I don’t get why voting is important”? How many citizens avoid the polls because they don’t understand the voting process, the issues, or the candidates’ positions? How many of those folks lack the needed literacy skills to find answers to their questions? My belief that our democracy works best when most of our citizens are engaged has compelled me to find ways to provide our students with access to some basic but vital electoral information. To help students acquire the knowledge, resources, and confidence needed to cast their votes, we created an event called the Prepared Voter Challenge, in which students will complete a series of activities to ready themselves for the upcoming election. The challenge includes registering to vote and procuring acceptable photo identification, of course, but its scope stretches beyond that. 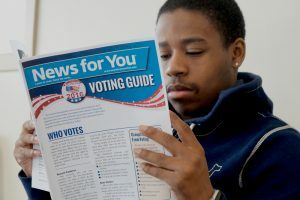 Students who sign up for the Prepared Voter Challenge will read simplified articles on topics such as reasons to vote, what we vote on, what to watch for in a debate, and how to think critically about campaign ads. Participants will learn about the benefits of registering and voting early, and will work with their tutors to make plans for transportation to the polls. Students will have a chance to identify issues important to them, and access credible, nonpartisan information to see where candidates stand on those issues. They will learn what to expect at their polling location, what to bring with them, proper etiquette at the polls, and how to ask for help from the election workers. Empowering our adult students to get involved in the political process takes a lot more than helping them register to vote. As educators, we have a responsibility to those we serve to help them navigate the electoral process, to help them understand the responsibilities of citizenship in our society, and to give them access to the tools they need to make informed choices. After most elections, the public often laments the low voter turnout; the Prepared Voter Challenge is our best effort to educate our community to engage in the process. President Franklin D. Roosevelt once said, “Democracy cannot succeed unless those who express their choice are prepared to choose wisely. The real safeguard of democracy, therefore, is education.” Around the same time period, acerbically witty American author and critic Alexander Woollcott commented, “I'm tired of hearing it said that democracy doesn't work. Of course it doesn't work. We are supposed to work it.” Taken on its face, Mr. Woollcott’s comment reminds us that our system of government depends upon an engaged and active populace for success – or for failure – and highlights how providing access to electoral information is an imperative in our mission to serve. ← Your support has changed 403 lives so far this year!